Shango's Son is a short story based on ancient African knowledge (Yoruba Ifa). Shango has a son who becomes his companion and protector. The son has amazing abilities that help Shango succeed. There is a dearth of children’s books on classic African cultures. Shango’s Son is therefore a welcome arrival on the book shelf. This colorful and well-illustrated book tells the story of father and son relationship in a world where piety, respect, ancestors, family, magical power, authority, and togetherness matter. This is about the Yoruba world and the becoming of Shango as a king and deity through the magical power of his son. 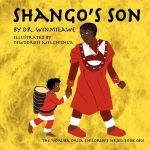 In her debut as a children’s book writer, Dr. Winwilawe begins her story from the time that Shango and his pregnant wife consulted their teacher and priestess. The priestess foretold that the conceived child will be a special person and that they should name him Biyi. Shango and his wife were happy with this news. And, to show their gratitude and respect to the priestess, they gave her presents of nourishing food — fruits and fish. Biyi was born, and he grew into a young boy inseparable from his father. He even became a protector of his father, using his musical wizardry as a drummer, singer, and dancer to charm his father’s foes. He beat his magical drum and sang so beautifully that even the elements of the heavens danced to a frenzy. Biyi worked wonders with his drum. The skies opened up with fiery storm, raging thunder, and luminous lightening crashing down to expose those plotting against Shango. The evil enemies of Shango were frightened and the people associated the divine power of thunder with Shango. Who dare question the thunder? No one can stop the thunder from making its presence known! They crowned Shango as their king and referred to him as the one whose divine power and authority cannot be questioned. Shango knew that this transformation in his life was due to the spiritual potency of his teacher, the support of his family, and the love and magical power of his son — Biyi. He therefore organized a feast to thank them for being the pillar of his support and elevation. They drank, feasted, and renewed their commitment to one another. Here the story ends with Shango becoming the king of Oyo and the Yoruba deity of thunder. It is an intriguing story that defies the normativity of becoming. Here, it is the son who made the father. Through the son, Shango attained political power and apotheosis. The bold, lavish, and highly contrasted illustrations are as communicative as the large font texts. The author and the illustrator beautifully synchronize their crafts. The former demonstrates the effectiveness of well-chosen words to convey action, thought and practice, and the illustrator does not spare the pictorial details of the cultural ambiance that inspired the story. The illustrations are by themselves a rich fodder for imagination that takes the reader to that idyllic landscape under the open blue skies where the branches of the tree provide shades for conversation, and the multi-colored architecture breaks the monotony of the green landscape. Dr. Winmilawe deserves praises for this gift of treasure trove of African history and culture to young readers. The plot is captivating and the narrative is stimulating. She has indicated that this is the first in The Yoruba Orisa Children’s Book Series. The Orisa are the deities (Gods and Goddesses) in Yoruba culture. According to the Yoruba lore, they number more than 400. Their mythologies are bottomless wells of inexhaustible water of knowledge, wisdom, and understanding. Their universal relevance makes this book and the series it pioneers an important milestone in Africa-centered childrens book publishing. I wholeheartedly recommend this book to teachers, parents, and young readers. The book brings out in sharp relief the idea of family, mythology, and the sacredness of father-son relationships in a Classic African tradition. The writing is excellent, and this book succeeds in making it possible for anyone to learn Yoruba vocabularies for everyday living.